An orchestral sized model, incorporating the latest innovations and designs. 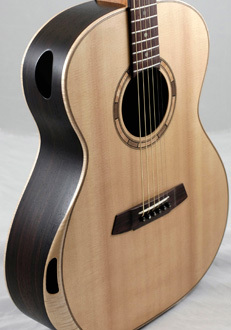 12th fret, 14th fret and cutaway models available. 2.2mm, 2.4mm or 2.6mm. Higher action is best for the more strident player! Solid: Birdseye maple / Flamed sycamore / Indian rosewood / maccasar ebony / African blackwood Also three or four piece including walnut, pear, cherry and apple.